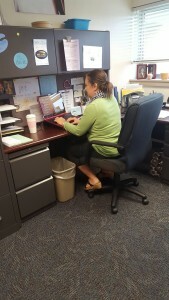 Mrs. Gail Ulmer is one of the counselors available to assist students who are struggling. Out of the students who responded, 27 percent mentioned struggling with stress, schoolwork, anxiety and depression. “We’re seeing much more of school avoidance and anxiety within the past two to three years,” said guidance counselor Mrs. Gail Ulmer. Anxiety and depression are difficult topics to cover considering many individuals don’t know how to start the conversation. Removing the stigma of mental illness is something not only necessary for Penn Manor, but as a community. “One third of the students I see are struggling with anxiety or some form of mental health distress. All of these we see regularly and we’re not surprised when it comes up,” said guidance counselor Mrs. Melissa Ostrowski. Resources that are available to students in the counseling office. “Everybody is struggling, and nobody is talking about it.” said Tere Villibrandt, who is a therapist at Samaritan Counseling Center and screens Penn Manor freshman for signs of depression. Students can always schedule an appointment to talk to a counselor for any reason. 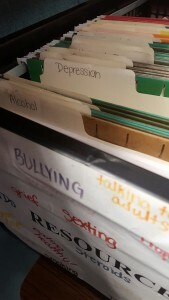 There are different documents available to students in the counseling office concerning topics like depression, anxiety, self harm, substance abuse and eating disorders. The responses that were received should show students and others in the community that they, in fact, are not alone, and other individuals feel the same way. “Students can be more comfortable with it to understand that everybody at some point in their lives experiences anxiety and experiences depression. That it’s normal, to talk about it but not make it a small thing. I say normalizing without minimizing” said Villibrandt.